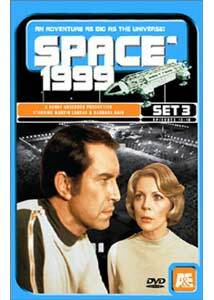 This and the fourth set of Space: 1999 DVDs completes the first season of the series. While some of the stories are interesting, many seem to be rehashes of other feature films or TV series. Still, as cheesy as some of these episodes are, they are still great to be able to watch some 25 years after the show originally aired. We have a couple of pretty good episodes in this set. There are also several great space battles to be seen here, and a few interesting set designs as well. Alan Carter (Nick Tate) is thought dead after his Eagle fails to return after a mission to destroy an asteroid on a collision course with the moonbase, but Koenig (Martin Landau) believes he is still alive against all odds, and mounts a rescue mission through the radiation cloud now surrounding the moon. When Alan is found alive he has seen a vision of Arra, Queen of the planet Astheria, which Helena (Barbara Bain) fears is radiation sickness, but things get worse�they are now on a collision course with a planet many times the size of the moon. Will Koenig's instructions be followed once he has come face to face with the inhabitants of the planet, a place where the Alphans may be able live, or will they meet their ends on this Collision Course? Somebody has been watching Zardoz! As the moon's trajectory carries it past the ice covered planet of Ultima Thuli, they receive a transmission that invites them to join the Earthmen on its surface, promising a long and wondrous life, while another voice warns them to stay away. After nearly freezing to death on the surface (a close shave, as it were, in reference to the special effects), Koenig, Dr. Russell and the professor discover that the lost crew of a Uranus expedition is alive and well in the subterranean caves, and have discovered the secret of immortality. However, eternal life is not without its consequences, and once again the commander is faced with a decision of whether the Alphans should consider this their new home, or if the story is too good to be true in Death's Other Dominion. After the crew of a reconnaissance Eagle returns to Alpha with a dead caveman in place of its missing crew, the mystery of the jungle planet Reytha begins. Commander Koenig immediately heads the rescue party, accompanied by Dr Helena Russell. While Alan Carter and Sandra Benes (Ziena Merton) do a topographical survey from their Eagle, Koenig and Russell head out on foot, but disappear after reporting while entering an area of thick fog. When Carter and Benes land on the surface, Carter is attacked by a stone age tribe, while Sandra is captured and carried off to their underground lair. With 40,000 years of evolution separating her from her captors, has she completed The Full Circle? While investigating an asteroid light years from the nearest solar system which the computer indicates has an atmosphere in its core. The crew use their lasers to open the door they think kill its inhabitant, Balor (Peter Bowles), a citizen of the planet Progron. However, when they return the alien to the moonbase for an autopsy, he is resurrected, and begins a battle with the security forces. Once Koenig and Carter arrive on the scene, Balor begins to make peace, explaining his captivity in the asteroid was a form of punishment for trying to end the immortality his race had discovered, but as strange occurences begin on the base Koenig suspects Balor is more than he appears, and that he is after more than just the End Of Eternity. Moonbase Alpha has met its match in War Games. As the moon approaches an unnamed planet, warcraft from Earth's past are moving into attacking range, and Koenig orders the defense Eagles to open fire. They are outgunned though, and after destroying most of the Eagles, they begin an all out assault on the moonbase, leaving half her crew dead and the base in ruins. The Alphan's only hope for survival rests in seeking refuge on the planet, so Koenig and Dr. Russell descend to the surface to try and negotiate a cease fire. There attempts at diplomacy fall on deaf ears however, and when Koenig tries to shoot their alien adversaries, they instead cut him down. Is this the end of Alpha, or is there an option they haven't thought of yet? As Alpha approaches a system with two planets on opposite sides of their sun, a monstrous battle cruiser piloted by female warriors approaches, neutralizing their defense system and leaving the Eagles grounded. As the battleship raises her canons, she aims not at the moonbase, but at the second planet, and the Alphans find their moon as the centerpiece in an ongoing planetary war in The Last Enemy. As the second planet retaliates, its missiles destroy the landed craft, and a lone survivor makes her way to sanctuary inside the moonbase. Dione (Caroline Mortimer) makes her case with Koenig, who is not too thrilled to be pulled into the conflict, and urges both sides to consider a cease fire. Both sides see the moon as a tactical advantage, and are making plans on how to use it, forcing Koenig to come up with his own ways of balancing the scales and saving his home. Image Transfer Review: While I wasn't that upset with the quality of the first two sets in this series, the problems discs one to four had continue here and get worse. There is a good degree of interlace artifacting, and interference in horizontal lines. Grain is pretty evident, though it doesn't have a natural quality to it, looking more like video noise. The excessive edge enhancement causes a lot of shimmer and aliasing. Colors are inconsistent, sometimes fine, other times washed out. Compression problems lead to items "floating" in the image. The Full Circle in particular looks overly dark, with poor contrast and muted color for much of the episode. This is still better than I remember it being on TV, but for a film source is nowhere near reference quality. Audio Transfer Review: The soundtrack's age is evident in the limited frequency response, and there were occasions of some distortion present in the source. Passable, but not inspiring. Extras Review: Both discs include photo galleries comprised of screen grabs, though the image quality is pretty bad, and the edge enhancement in their sources is glaring, with characters featuring massive halos. The shots also tend to have extremely high contrast, and look very unnatural. Better than nothing I guess. Set number three is housed in a cyan box, and the individual cases again feature Martin Landau and Barbara Bains singlely on the covers. The episode guides included in wave one have been replaced by a single sided ad for other A&E box sets, though a synopsis is included on the back of the outer case. With this and box set four, the first season of Space: 1999 is now available on DVD. While the image quality leaves a lot to be desired, I'm still happy to have these. The stories in this set are a bit of a mixed bag, but we do get some decent action and a couple of good episodes. This may be the best this show has looked, but there is significant room for improvement.